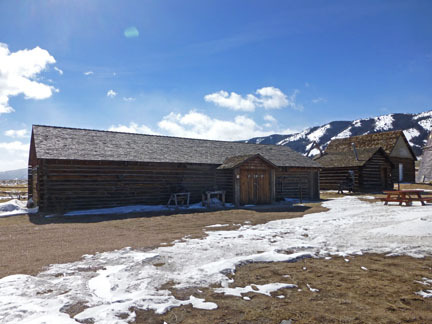 This log barn was originally located on the old Engen Ranch, on the south end of the Centennial Valley, and dates to approximately 1895. It was donated to the museum by the Deerwood Ranch, owned by the Cole family, on August 14, 1993. It was taken apart log by log and reassembled on the grounds by the Centennial Lions’ Club. From 1994 until approximately 2008 it was used for an annual community garage sale. It’s now home to a laundry exhibit, an original oak bench from the waiting room of the Historic Laramie Railroad Depot, ancd on the 4th of July weekend it’s transformed into an art gallery for the annual Centennial Valley Art Show and Sale.